During the month of February, Telesis focuses on the character trait of caring. What better way to show you are caring by participating in our school wide NEU fundraiser? Every year, NEU Schools like Telesis unite to take part in raising funds for a charity of the year. With a goal of 100% participation, we select charities that offer our students the experience of giving to other children in need. Because stewardship is a core value of our network, it is our desire to foster such a trait in all of our NEU Students, no matter their personal challenges. This year, we are uniting to support our eight NEU Schools, their staff, students, and families affected by Hurricane Harvey. 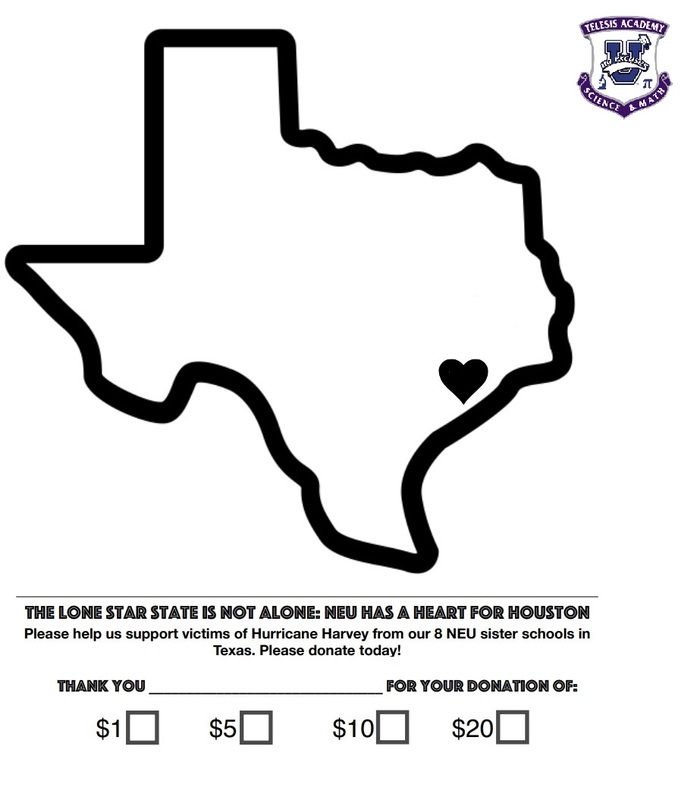 Students who donate will be provided the NEU Heart for Houston paper to design, color and mark their donation. Donations will be collected by your child’s classroom teacher and the decorated Heart for Houston donation sheet will be posted on the classroom door. We are striving to raise at least $1500.00 which would surpass our 2016-2017 school year charity contribution total. Students who donate at least one dollar will receive the Heart for Houston paper to decorate and post as well as a free dress day on Tuesday, January 20 th. Please consider donating to help the victims. The rebuilding will take some time and we want our NEU family to know they can count on us.